Update (30 June 2017): I will archive this post from Jan to June 2017, after this last update for the first six months. Along with the planned stamp issue on Shrimad Rajchandra Ji, India Post issued the se-tenant stamp on Banaras Hindu University on 28th June. The date for issuance was not announced prior to the day of issue. The Prime Minister of India participated in an event to celebrate the centenary of Sabarmati Ashram and the 150th birth anniversary of Shrimad Rajchandra on 29th June in Ahmedabad. A special cover was released on the Sabarmati Ashram and a postage stamp on Shrimad Rajchandra. The Sabarmati Ashram was Mahatma Gandhi's home in Ahmedabad and Shrimad Rajchandra was Gandhi's spiritual guru. That's some good event planning. The stamps on Banaras Hindu University was issued by MoS Communications on 28th June. The minister is an alumni of the Institute of Technology and it made sense to have him participate in the dedication ceremony. Even though the stamp designs showed a few buildings on campus, it would have been nice to put Madan Mohan Malaviya's image as well. He was instrumental in developing the idea of this university and was its founder. Surprisingly, made an impromptu announcement that a new MyStamp will be issued on the university and its founder. No stamp issue dates have been announced for new stamp issues. That's it for the blockbuster six months of 2017. Over 100 stamps haven been issued this year so far and India Post is well on its way to create a record of sorts. This post is getting excessively long and I'm archiving it. A new post will be started for the remainder of the year. Update (24 June 2017): In addition to the two scheduled stamp issues on Jhala Manna and Survey of India, another stamp on the 50 years of Passports Act, 1967 was issued on 23rd June. Here's a quick update on the three issues so far and some on forthcoming stamp designs. The stamp on Jhala Manna was dedicated by the local MP, C. P. Joshi on 18th June in Barisadri (Chittorgath district). Next, a set of two stamps along with a miniature sheet was issued to celebrate 250 Years of Survey of India in New Delhi on 22nd June. The event was attended by Minister of Science and Technology and MoS Communications. These stamp designs included the logo of Survey of India, an old theodolite and an old image of the organization's museum in Dehradun. Even though the design was minimalist and clean, given the rich history of Survey of India, it could have been far more detailed. The stamps could have included some maps and a reference to the 250 years as well. Wish these stamps were designed by Kamleshwar Singh or Sankha Samanta. Another stamp, previously unannounced or approved, was issued to commemorate 50 Years of the Passports Act, 1967. The Rs 25 stamp was issued by MoS Communications and Minister of External Affairs on 23rd June during a conference of passport officers. The act that enabled provisions of issuing passports to Indian citizens was enacted on 24 June 1967. The Minister of External Affairs said during the event that the original plan was to issue a special cover, but then she asked MoS Communications to consider a postage stamp instead. So a stamp design was prepared, approved and printed within three days before the stamps release! Stamp designs for two new issues, Ramayana and Banaras Hindu University were found on the internet as well. Images for these and other new stamps have been on several social media platforms. No issue dates have been announced barring the one on 29th June (Shrimad Rajchandraji). Update (17 June 2017): As has been the norm for past several years, India Post has not shared information on any new dates of stamp issuance. Several collectors and news reports have found details for potential stamp issues planned for June. A stamp on Man Singh Jhala, colloquially Jhala Manna, will be issued in Chittorgarh district on 18th June. It's likely the MoS Communications will travel to Barisadri for the dedication ceremony. A set of two stamps could be issued on 250 Years of Survey of India on 22nd June. I had predicted this issue on 01st April in another blog post, even though it was not approved by the Philatelic Advisory Committee late last year. The Prime Minister of India will be in Gujarat on 28-29th June and it is possible that during a visit to the Sabarmati Ashram in Ahmedabad, a stamp on the 150th birth anniversary of Shrimad Rajchandra Ji could be dedicated. Images of this stamp have been out in public for a few months now. There has been some momentum on a series of 11 stamps on Ramayana, an epic of Hindu religion. This highly anticipated set of stamps could be issued sometime in June, but again, no firm dates yet. PNG Post is likely to complete printing of the Papua - India joint stamp issue by end of June and then the stamps could be issued anytime after that. The Indian version of this stamp, which has an identical design, is also under print. Update (04 June 2017): It's been a few weeks since new updates were added to this post. I was traveling and India Post information was received somewhat late as well. Several stamps, most previously known, were issued in late-April and all through May. First up on 22nd April was a stamp and a miniature sheet on a telecommunications training institute in Jabalpur, Madhya Pradesh. This organization is celebrating its 75th year and the MoS Communications dedicated the stamp at a ceremony in Jabalpur. There are two problems with this particular stamp issue that need to be addressed. Why was a second stamp and even a miniature sheet necessary on the institute, the first one having been issued in 1992? Why was the miniature sheet designed as if it was commemorating an art institute? India Post seriously needs to re-consider giving projects to artists that cannot even comprehend the stamp subject, telecom in this case. The coffee-scented stamp was dedicated by MoS Communications and MoS Commerce & Industry in Bengaluru at a ceremony organized in the GPO on 23rd April. Kudos to India Post for a well thought idea, but again I have two problems to highlight: the stamp design and the coffee fragrance itself. Just showing coffee beans and coffee powder on a sheet of gummed paper makes no sense. Coffee Board of India has done many print media campaigns and could have easily assisted in developing a better design. Many collectors have also complained that the coffee fragrance was not strong enough and some even suggesting that India Post should recall this product. The stamp issue with three designs on Telugu poets and authors was well designed and issued in Guntur, Andhra Pradesh on 26th April. The only suggestion for improving these type of issues is to consider categorizing them under the Personality Series, like it was done late last year on the Personalities of Bihar. Prime Minister of India dedicated a 25 Rupees stamp on the famous Bhakti Movement saint, Ramanujacharya on 1st May to commemorate his 1000th birth anniversary year. The stamp design by Subir Das was simplistic and unlikely using images from Sriperumbudur (the saint's birthplace). The Prime Minister also mentioned about this stamp before it was issued on his monthly radio program, Mann Ki Baat in late April. Telecom Regulatory Authority or TRAI is celebrating its 20th year of formation and a stamp well designed by Kamleshwar Singh was dedicated at a seminar organized in New Delhi on 5th May by MoS Communications. Had the logo of TRAI been included on the stamp itself, this would have become a complete stamp issue with all relevant design elements. Oh, well. The next stamp issue was along the expected lines. It was to celebrate 100 years of Champaran Satyagraha and was dedicated in Bettiah, Bihar on 13th May by MoS Communications. This set of 3 stamps was designed by Sankha Samanta and was almost executed to perfection. The stamps were printed in indigo color to represent the indigo farmers of Bihar that initiated the revolt against the British rule in 1917. But, like most stamp issues this year, this one had a glitch as well. The 10 Rupees stamp showing Kasturba Gandhi does not have the inscription in Hindi, whereas the 25 Rupees stamp showing Mahatma Gandhi and indigo farmers has two inscriptions in Hindi instead. This error was recognized by the stamp designer as well. We'd recommend to buy the 10 Rupees stamp sheet for collection. A stamp on Hanagal Kumaraswami Ji of Karnataka was dedicated on 19th May in Hubballi by MoS Communications. This stamp celebrating the 150th birth anniversary of the ascetic was not approved late last year, but was recently proposed by Pralhad Joshi, Member of Parliament. Kirron Kher (Member of Parliament) dedicated the set of five stamps on eminent Indian writers on 31st May at Panjab University, Chandigarh. This stamp issue had been pending since January 2017. Like has been the case over several years, no dates for future stamp issues have been shared by India Post, leaving no time for collectors to prepare and plan stamp purchases. Update (18 April 2017): A se-tenant stamp on Dr. B. R. Ambedkar's Deekshabhoomi was dedicated by the Prime Minister of India in Nagpur to celebrate Ambedkar's birth anniversary on the 14th April. Even though I haven't been able to get information on the designer yet (will update this later), the stamps were well designed. It reminds of the se-tenant on Akshardham Temple issued late last year. Despite this well planned stamp release, the stamp set on Eminent Writers was postponed once again. The design for these stamps was shared by BetterPhilately earlier, but the issue date continues to be uncertain. Two other commemorative stamps are planned for issuance in April, but let's wait and watch. We can now confirm three other MyStamp issues that were issued in 2017, one in March and two in April that seemingly went unnoticed. Two MyStamp sheetlets were issued by the President of India on 160 years of University of Mumbai (March 17) and another on Global Exhibition on Services (April 17). The third stamp on Indian Journal of Ophthalmology was put on sale on ePostOffice on 7th April, but no dedication ceremony has been held yet (Update on 19 April 2017: This stamp has been removed from ePostOffice and is no longer available for sale). Eminent Writers (5 designs w/ Miniature Sheet, Rs 50): Krishan Chander, Balwant Gargi, K. V.
Update (10 April 2017): A poorly designed stamp on Cub Scouts was dedicated by the Minister of Communications on 30th March. This stamp was essentially an image of cub scouts in front of the headquarters of the Scouting organization in New Delhi. It is surely the worst design among the ones issued this year. India Post and its leadership ought to select some sensible designs and artists to improve and build on the the past experience rather than provide patchy progress, one good step forward (thematic issues this year) and several steps back (Cub Scouts, M. G. Ramachandran). India Post has finally put out some issue dates for stamps in April. Stamps on several personalities will be issued this month. Another new addition in the ever expanding list of approved stamps is Ambedkar Institute of Telecom Training, Jabalpur. A stamp was issued in 1992 to commemorate the same institution, but this new one will now celebrate 75 years of its establishment. There are many organizations and events that deserve to be celebrated on stamps and re-issuing stamps on the same subject repeatedly had no logic. Update (28 Mar 2017): Another huge set of stamps with 20 designs was dedicated on 25th March at the Heritage Transport Museum near Gurugram. These stamps show Means of Transport Through the Ages, depicting various modes of transport used in India over the past several centuries. Brahm Prakash designed the stamps and associated products. This issue has a striking similarity to the Indian Metal Crafts stamps issued in 2016; also designed by Brahm Prakash. His design appears to focus on the object and has minimal other design elements and doesn't attempt to develop a story through the series. I had posted a list of the stamp designs in the last update (see below) and that appears to be accurate. Some additional details and an image are provided below. This series deserves a follow up set of stamps in a couple years and should include the following: Bicycle, Moped and Motorcycle, Auto-rickshaw and Taxi, Cars (Jeep, Vans and Maruti), Trucks, Trains and Boats. Dates for no other stamp issues have been revealed by India Post. I had also reported on Better Philately twitter feed a few weeks ago that a new MyStamp was issued on Montfort School, Yercaud. It has been confirmed that indeed this was a new MyStamp to celebrate the school's centenary year, which was presented at a ceremony in mid-February. A MyStamp was also issued on the Montfort Brothers of St. Gabriel in 2016 as well. No images for this stamp are available yet and the stamp sheet is not for sale on ePostOffice either. It was found that another customized MyStamp was printed on Sri Kanchi Kamakoti Peetam in Febryary 2017. A grand temple ceremony was held on 09th February and the MyStamp sheet celebrates this event. Check out an image of this stamp sheet on Better Philately twitter page. This stamp sheet is not yet available for purchase on ePostOffice. Update (18 Mar 2017): Just one new commemorative stamp has been issued by India Post over the last few weeks. The Prime Minister of India dedicated a stamp on Yogoda Satsanga Society of India on 07th March in New Delhi. The stamp design by Alka Sharma uses most of the elements from the centenary year logo itself, but nonetheless is appealing. Several stamps are planned for issuance this year, but India Post has not provided any new dates for new stamp releases. See images for some forthcoming stamps below. The set of stamps for Means of Transport through the Ages appears to be well designed, but several modes of transport are missing. For example, no bicycles, motorcycles, Indian cars, trains and airplanes are included. I imagine there will be another set of stamps necessary to complete this series. Two new stamp subjects, Cub Scouts and Telecom Regulatory Authority of India (TRAI) have also been included in the stamp program. One of these stamps will likely be issued in March 2017 itself, but no specific date is confirmed. Update (04 Mar 2017): Since the last update, three stamps have been issued by India Post. Two of these were MyStamp sheetlets, one fragrant stamp issued on Rose and another one on Holi festival. Both these are personalized sheetlets, where a picture can be provided to the post office for printing on the blank portion of the stamps. Two points of note: Firstly, description on both the stamps has English first followed by the vernacular description in Hindi. This had not happened in many years and there are rare examples of this. Secondly, MyStamp is not explicitly described on individual stamps. This feature has been inconsistently used by the stamp designers for MyStamps issued in the past. The other stamp issue was on Ladybird Beetle in 4 designs. Suresh Kumar Achari designed this set of four stamps, each showing a beetle in different color. Stamps were issued in two formats, a miniature sheet containing four stamps and 4 sheetlets with 16 stamps each. 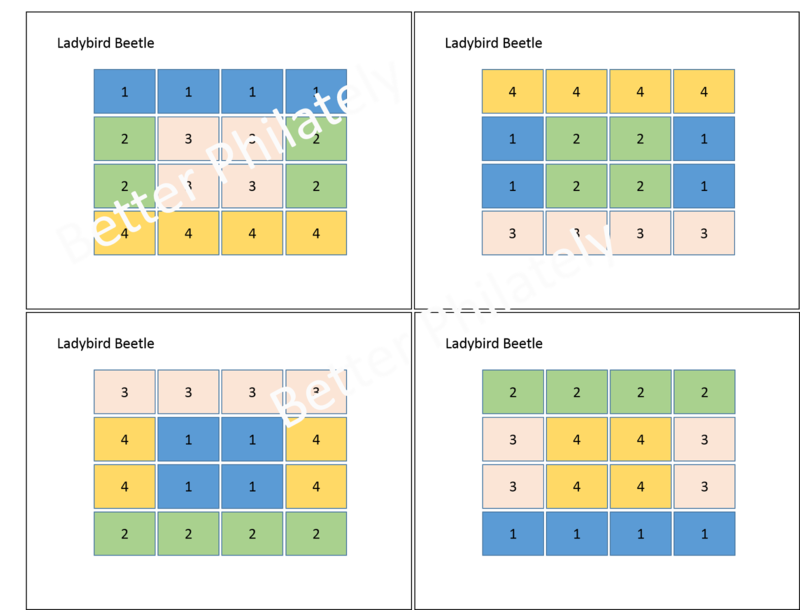 The format of these sheetlets was different in each sheetlet and not a single se-tenant block of four can be obtained! These sheetlets do allow to have multiple formats of se-tenant of 3 stamps. A postage stamp on Yogoda Satsanga Society of India (established by Yogananda Paramhansa in 1917) will be dedicated on 07th March by the Prime Minister of India in New Delhi. Several other pending stamp do not have known dates of issuance. Update (13 Feb 2017): It is likely that the issuance of the fragrant souvenir sheet on Coffee is likely postponed. Other stamps that have so far been issued as planned. The first issue in February was a miniature sheet of 16 designs showcasing some Head Gears of India. These stamps designed by Gulistaan were not issued in any other format. This pane of stamps was dedicated by senior postal officials at the 31st Surajkund Crafts Mela in Faridabad. Along with the Hear Gears stamps, a new MyStamp sheetlet was also issued to celebrate the Surajkund Festival itself. Another MyStamp sheetlet was issued on the same day on the foundation day of Energy Efficiency Services Limited (EESL) in Delhi. This organization implements Indian government's energy efficiency programs - it has played a key role in the recent mass distribution of LED lights across India. The very next day, on 11th February, a stamp was issued on the bicentenary of The Poona Horse regiment of the Indian Army. The stamps were dedicated in a ceremony at the regimental headquarters in Meerut. A stamp that was postponed from mid-January on Ramjas College Centenary was finally issued by the President of India in New Delhi on 13th February. Ramjas College was one of the 5 founding colleges of Delhi University, the others being St. Stephens College, Hindu College and Zakir Hussain College. A fragrant MyStamp sheetlet on Rose will be issued on Valentine's Day. This along with many other stamp issues will likely be available for purchase on ePostOffice, but lately, no updates have been made on ePostOffice, and no clear reason has been provided by the post office. Update (06 Feb 2017): January ended with 35 stamp issues (including 2 sets of 12 designs for Splendor of India). The last issue in January was on the new venture from India Post, a Payments Bank. Two branches of this bank were launched by the Finance Minister and MoS Communications of India on 30th January, along with the stamp release and the release of the bank's logo. The stamp was well designed - with the new logo and the postman as the central theme - by Sankha Samanta. Stamp designs are refreshing this year and a welcome change from the lack of innovation last few years. Tentative dedication dates for a few stamp subjects are known and listed below. The Headgears of India stamp issue was originally listed for issuance in 2013. This will likely be a set of 16 designs issued in one miniature sheet of 16 designs, but let's wait to confirm. India Post's website has also listed the Poona Horse and Ramjas College stamps for issuance next week. Right after these stamps, two stamps with fragrance will be issued on Valentine's Day. Three other stamp issues are coming up for release soon, but the dates are yet to be confirmed. Will there be a stamp issued on J. Jayalalithaa this year? Will the India-Russia joint stamp issued mid-March on in June, when the Prime Minister of India visits Russia for an economic conference? I've updated details for the January 2017 stamps in another post. Click here to find more. Update (24 Jan 2017): India Post has been putting out quite a few announcements for stamps releases in 2017. My thought is that India Post will likely issue over 100 stamps in no time and many of these could be higher denomination stamps. I suggest that collectors reduce the requirements in the philatelic deposit account at the philatelic bureaus to lessen the expenditure and purchase desired issues on ePostOffice or over the counter. This approach is typical in the United States, where very few collectors have standing orders in post offices. It is best to buy only what is needed to keep the collections complete. I believe that India Post is planning a large number of stamp issues and high denomination stamps to fulfill sales targets and make stamp sales a lucrative business. Last few weeks haven't seen too many new stamp issues, but one of the issues was correctly predicted by BetterPhilately. This year is M G Ramachandran's birth centenary and India Post issued a stamp in Chennai on 17th January on his 100th birthday. The stamp was poorly designed, with remnant of some chair on the right shoulder of the personality. I am still waiting to see who designed the stamp, but overall another case of bad design and complete lack of innovation. Stamps on Headgears of India, Means of Transport through Ages, Coffee (Fragrant stamp), Ramjas College, India Post Payments Bank, Ladybird Beetles and Rose (Fragrant MyStamp) are likely to be released in the next few months. Issue dates for very few stamps are known, but some speculated dates are below. Images of the Coffee stamp sovenir sheet (we've tweeted the image) and FDC were available online. This will be a 100 Rupee stamp with the fragrance of Coffee. Although a good concept, the stamp design and the denomination are both a dampener. The stamp on Ramjas College, Delhi was lined up for dedication on 17th January, but was postponed at the last minute with no clear reason provided. Centenary celebration of the college even included a date and time of the stamp issuance by MoS Communications, but the event never happened. This stamp will likely be issued sometime during this year. Quite a few of the new stamp issues are being announced, many of which were not included in the 'approved' stamp list provided earlier in January. India Post should provide a complete list of stamps issues for 2017 as opposed to sharing it piecemeal. Update (07 Jan 2017): Stamp issuance in 2017 began with a bang, on 01st January itself. A well-designed stamp issue on Splendor of India: Happy New Year was issued with 12 designs. The stamps were issued in a miniature sheet format (similar to the Wild Flowers issue in 2013), with all 12 stamps on the same pane. All stamps are of Rs 25 denomination. Along with this one miniature sheet, India Post produced a unique product in the form of a calendar with valid postage stamps. There are 12 stamp sheets, one for each month with one stamp each. These are essentially miniature sheets with holes punched for binding the calendar together. The calendar stamps are also priced higher than the face value, at Rs 1000, each sheet of Rs 25 costs Rs 83.3. Stamps in these calendar sheets carry the same design, but are of different size and likely the quality of paper is different as well. Due to these differences, each catalog number will likely have two varieties for this issue (24 stamps in all for a complete collection). Two other observations - Sankha Samanta is back designing stamps for India Post. After almost a complete hiatus in 2016 (other than the Legendary Singers stamps), the artist has begun the year on a strong note. We hope that India Post and it's leaders continue to assign more stamp designing projects to the esteemed team of artist comprised of Mr. Samanta, Kamleshwar Singh, Bharati Mirchandani, Brahm Prakash and Suresh Kumar. Stamp cancellations and first day covers designed by Alka Sharma and Nenu Gupta could provide a good balance to the designing team. The second observation is about the spelling error on one of the stamps out of the twelve. The design depicting the art of Pietra Dura spells the word Pietra incorrectly as Peitra. We recommend that the proof reading team at India Post do a better job of catching such glaring errors before approving for printing. We have written earlier about the need for research unit in the department to gather and disseminate accurate information (click here for that post). The second issue of 2017 was also a nicely designed miniature sheet on 350th birth anniversary of Guru Gobind Singh. The stamp was issued in Patna by the Prime Minister of India during the Prakash Parv celebrations on 05th January. Kamleshwar Singh designed the stamp and his style of design (like the unique font) were easily recognizable. Bringing back Mr. Singh to design stamps is a welcome step by India Post. His stamp designs have been our favorite over the last 15 years. We hope this trend to focus on art and stamp design will continue for all future issues. Another set of two stamps were issued on 07th January by the Prime Ministers of India and Portugal to celebrate over 500 years of ties between the two nations. Click here to read about this issue. It's been a great start to the new year. We hope India Post will spread stamp releases evenly all through the year, reduce the number of high denomination stamps and MyStamp issues to control the cost of collecting Indian stamps. Finally, there are still quite a few stamp subjects that were not included in the approved list of stamps for 2017. We request these subjects be considered for release while postponing some thematic subjects. In this regard, the list at the bottom of the post is being combined with our wish list posted on 23rd December 2016 and a final list is posted below. These stamp subjects have not been listed for release by India Post, but we recommend for inclusion in the stamp program. - There are six joint issues listed, with Armenia, Belarus, Canada (two themes), Papua New Guinea, Portugal and Russia. Belarus and Canada were new additions, and haven't shown far been shown in these countries' stamp program. - Out of the 65 new subjects, only 15 are personalities. This number is likely going to increase because proposals for many important personalities have either not been submitted or have not yet been approved. - Many of the previously announced themes (Jataka Tales were approved as far back as 2001) have been included in this approved list. Our blog post for previously approved issues has been tracking these subjects and this effort by India Post is much appreciated. - The total number of issues this year could be as high as 2016, resulting in a significant increase in cost of collecting one stamp each or the minimum purchase quantity. Update (27 Dec 2016): India Post will issue 13 miniature sheets comprised of 12 designs (1 sheet with all 12 designs and 12 other sheets with one stamp each) on the theme, Splendor of India - Happy New Year on 01st January itself. Each stamp will be of Rs 25 denomination. Stamp designs have not been revealed and is not easy to figure out what to expect. Based on the images India Post has been circulating on its social media pages, it appears to include different forms or art work. Let's wait and watch. Dates for no other issues have been announced yet, but some could be as listed below. Update (23 Dec 2016): While waiting on India Post to provide details for the Stamp Program for 2017, we recommend the following subjects must be considered for releasing stamps this coming year. The first part of the list shows eminent personalities and the second half lists some important events or institutions that deserve recognition. This is only a 'wish list' and we will continue to monitor the original listing posted at the end of this post for real-time updates as they are obtained from India Post. In other news, it appears that a set of 12 miniature sheets and 1 sheetlet will be released in the form of a calendar for 2017 on the theme, Splendor of India. Details for this issue are not available, but given that it contains a calendar one can safely assume it to be released in January itself. Update (17 Dec 2016): It appears that the fragrant stamp on Coffee could be issued in January 2017 instead of December 2016. An announcement for sale of a miniature sheet on ePostOffice was posted on India Post's social media pages, but there is no confirmation from India Post for the issue date. Two other stamp issues, both carried forward from 2016 are likely to be released in 2017. As was predicted correctly by BetterPhilately, the joint issue with Portugal will be issued on 07th January during the visit of the Prime Minister of Portugal. The other joint issue that was repeatedly postponed, with Papua New Guinea will now be issued on 03rd April 2017. The stamp was originally planned for release in April 2016, now stands to be dedicated exactly one year later. Better late than never. We also believe that now that Parliament session is complete, India Post will put out a press release for the outcome of the Philatelic Advisory Committee that has deliberated for the stamp subjects for 2017. There are over 230 pending proposals before the Committee and we hope information for the proposed stamps will be shared with stamp collectors soon. Bhandarkar Oriental Research Institute, Pune will celebrate its centenary year in 2017. India Post should consider issuing a stamp on this occasion. We've learned that the organization may not be able to afford purchasing 100,000 stamps on their own budget and are hoping that the federal government will take cognizance and issue the stamp as a gesture of appreciation of their services to oriental research. Update (25 Nov 2016): Portugal's Prime Minister is scheduled to visit India as the Chief Guest for Pravasi Bharatiya Divas to be held from 07-09 Jan 2017 in Bengaluru. It is possible that the India-Portugal Joint stamp issue could be released during this visit, especially if there is a bilateral component as well. It appears that two of the stamps, Emperor Vikramaditya and G G Joshi could be released in 2016 itself. India Post's list of forthcoming releases shows these issues listed as approved for release in December 2016. Original Post (18 Oct 2016): Although India Post is unlikely to provide timely information for it's stamp program for 2017, the following subjects could be under consideration for release next year. This blog post will be used to provide updates and other information for our readers for all stamp subjects for 2017. Another blog post will list the stamp issues once all the relevant information for printing and designs are available. Do continue to follow both the posts regularly once the new year begins. Feel free to drop a message if there is additional information to be shared with the readers. Happy Holidays.